On December 9, President Obama signed into law the Telework Enhancement Act, a bill designed to increase telework among federal employees. Sponsored by Representatives John Sarbanes (D-MD), Frank Wolf (R-VA) and Gerry Connolly (D-VA), the legislation gives federal agencies six months to establish a telework policy, determine which employees are eligible to telework, and notify employees of their eligibility. Agency managers and employees are required to enter written telework agreements detailing their work arrangements and to receive telework training. Under the Act, teleworkers and non-teleworkers must be treated equally when it comes to performance appraisals, work requirements, promotions and other management issues. Each agency must designate a Telework Managing Officer, and must incorporate telework into its continuity of operations plan. Supporters of the measure, including the National Treasury Employees Union and the Telecommunications Industry Association, rightly tout its potential to improve the productivity of federal employees, reduce the government’s overhead expenses, decrease energy consumption and cut carbon emissions. Indeed, the Telework Research Network estimates that if the eligible federal workers who wanted to telecommute did so once a week, agencies would increase productivity "by over $4.6 billion each year” and save “$850 million in annual real estate, electricity, and related costs.” The country would save nearly six million barrels of foreign oil and reduce greenhouse gas emissions by one million tons per year. The bill would enable agencies to continue functioning during emergencies (federal telecommuters saved the government an estimated $30 million per day when D.C.-area snow storms shut down offices last winter), and it would decrease traffic congestion. Increasing the number of federal telecommuters is a good first step towards empowering the nation to tap telework’s many benefits. However, a diverse group of advocates would like to see telework become widely available for all workers. The Obama Administration endorses this goal. Proponents of broad access to telework include champions for small businesses and for energy independence, transportation alternatives, work/life balance, homeowners, environmental protection, disabled Americans, and rural economic development. To maximize telework’s promise — including its potential to open employment opportunities for 17.5 million people — Congress must enact comprehensive legislation offering employers, workers and other stakeholders in both the public and private sectors a wide array of cogent reasons to expand the practice. Perhaps the single greatest regulatory barrier to telework is the threat interstate, part-time telecommuters face of being taxed twice at the state level on the wages they earn at home: once by their home state and then again by their employer’s state. New York has been especially aggressive in taxing nonresidents on the wages they earn at home even though their home states can tax those wages, too. The double tax risk makes telework unaffordable for many Americans. Proposed federal legislation called the Telecommuter Tax Fairness Act would eliminate this roadblock to telework, prohibiting states from taxing the income nonresidents earn in their home states. This bill, introduced in the 111th Congress by Representatives Jim Himes (D-CT) and Frank Wolf, enjoys bi-partisan support from lawmakers representing states across the country. It must be included in any package intended to accelerate telework’s adoption. The complexity of the current home office deduction discourages home-based workers from taking advantage of it. Potent telework legislation would give both home-based business owners and telecommuting employees the option to take a standard home office deduction. Because managerial resistance is a significant obstacle to telework’s growth, and because managers who telecommute themselves may have a more positive view of telework than their office-based colleagues, businesses should receive added incentives to allow managers to telecommute. Workers should be allowed a tax credit based on the amount of time they spend telecommuting or on the cost they incur to purchase equipment and services necessary for telecommuting. They should have the option to treat the value of all equipment and services the employer provides to facilitate telework as a fringe benefit excludable from their taxable income, even when personal use of the tools is also permitted. Insurers covering losses that telework can minimize should be recruited to promote telework with tax advantages. Because experienced teleworkers enable their companies to continue operating even when emergencies render the main office unusable, business continuity insurers can limit their exposure by increasing the number of their policyholders that maintain strong, well-designed telework programs. They should receive incentives to do so. Automobile insurers should also be enlisted. The less frequently people drive, the fewer accidents occur and the less liability car insurers face. To motivate these insurers, Congress should offer them tax advantages based on 1) the proportion of their corporate policyholders that have both significant telework programs and aggressive policies to replace work-related driving with Web-based or telephone conferencing; and 2) the proportion of their individual policyholders who telecommute regularly. Because businesses with dispersed workers need less office space, commercial landlords may wince at decentralization. However, the landlords able to fill their buildings with a greater number of tenants requiring less space - rather than fewer tenants requiring more – can thrive. In addition to operating greener and more cost-efficient sites, these landlords can reduce their risk of loss: Because each tenant represents a smaller proportion of a landlord’s total revenues, a single tenant’s default or decision to relocate is less likely to deal the landlord an insurmountable blow. To entice commercial property owners to encourage their tenants to adopt telework, Congress should offer the owners tax incentives based on the proportion of their tenants that have either vigorous telework programs or well-enforced policies requiring employees to replace business travel with remote conferencing. By reducing the demand for roads and mass transit, telecommuting minimizes the cost of repair, maintenance and expansion of such infrastructure. Before the federal government subsidizes state and local transportation investments, the funding recipients should be compelled to mitigate costs by promoting telework. One step that states receiving federal aid should be required to take is to eliminate tax barriers to interstate telework. For example, they should be prohibited from subjecting a nonresident company to business activity taxes when the company’s sole connection to the state is its employment of a few in-state telecommuters. States could also allow car insurers to offer pay-as-you-drive policies. States and municipalities could require their agencies to develop telework programs for their own workers and to engage only those contractors that make the maximum possible use of telework. They could require agencies seeking funds to increase their car fleets or facilities to submit an assessment of whether telework could eliminate or reduce the need. They could compel their employees who seek approval for business travel to demonstrate that remote conferencing would not be an adequate substitute. They could authorize agencies to retain the funds the agencies save as a result of telework. States could create offices that promote telework and provide technical/legal support for both public and private employers developing telework programs; designate high traffic and pollution days as telework days and publicize them; and conduct public awareness campaigns to encourage telework, including campaigns specifically targeting businesses. Municipalities could eliminate telework-hostile zoning rules. All of these proposals would go a long way towards minimizing needless travel. Some would cost the federal government nothing or save it money. Others require a federal investment, but the investment would be made via business and individual tax breaks — welcome incentives for many members of the incoming Congress. Together, these suggestions would create jobs and strengthen the nation’s energy security. They would reduce traffic, carbon emissions and transportation costs; enable workers to meet conflicting job and family responsibilities; help businesses lower expenses, and drive profits. These are fundamentally important goals with bi-partisan support. Congress should act quickly and forcefully to unleash telework’s potential to meet them. 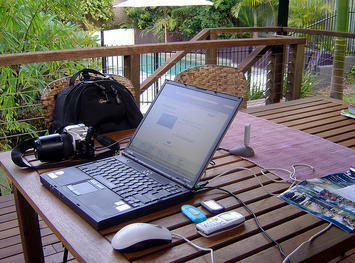 Photo by By Rae Allen, "My portable home office on the back deck"
Nicole Belson Goluboff is a lawyer in New York who writes extensively on the legal consequences of telework. She is the author of The Law of Telecommuting (ALI-ABA 2001 with 2004 Supplement), Telecommuting for Lawyers (ABA 1998) and numerous articles on telework. She is also an Advisory Board member of the Telework Coalition.